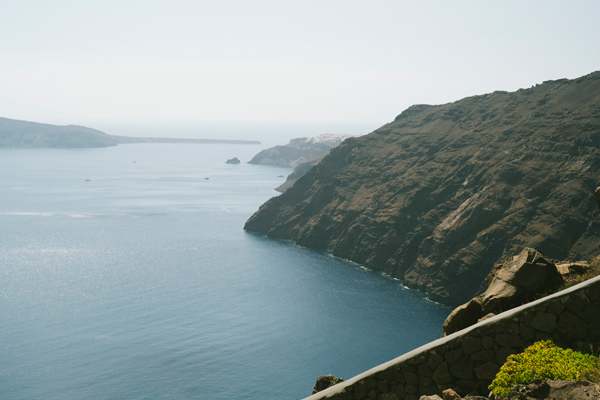 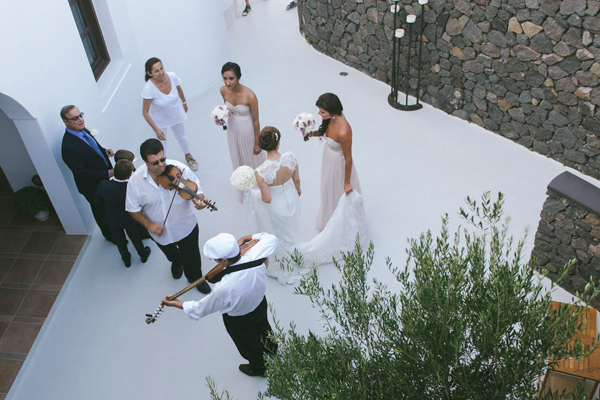 I am so fortunate to spend endless hours swooning over gorgeous images, however… I must admit that the white and blush wedding in Santorini photographer Nikos P. Gogas shared with us… took my breath away. 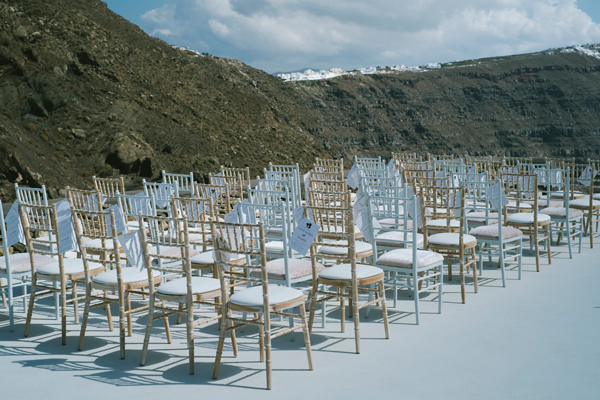 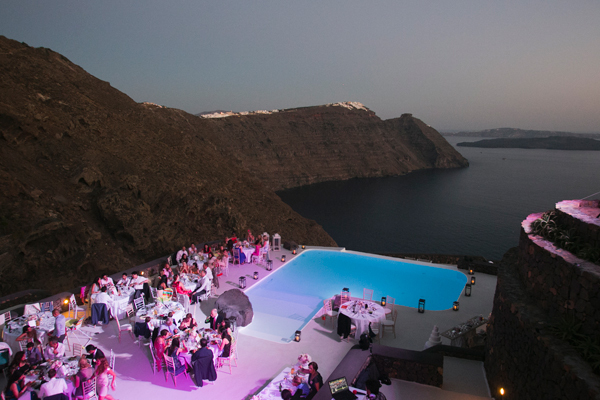 From the picture perfect location, to the stunning decoration details carefully curated by the talented team at Santorini Glam Weddings, this is a destination wedding you seriously do not want to miss. 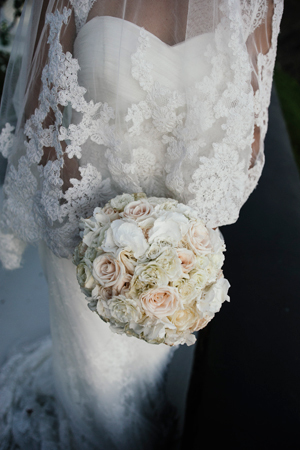 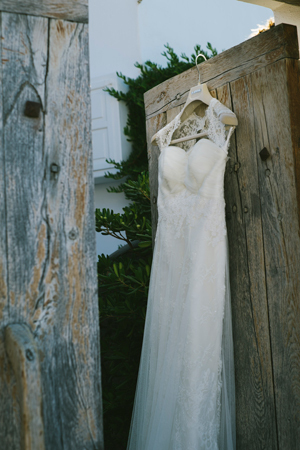 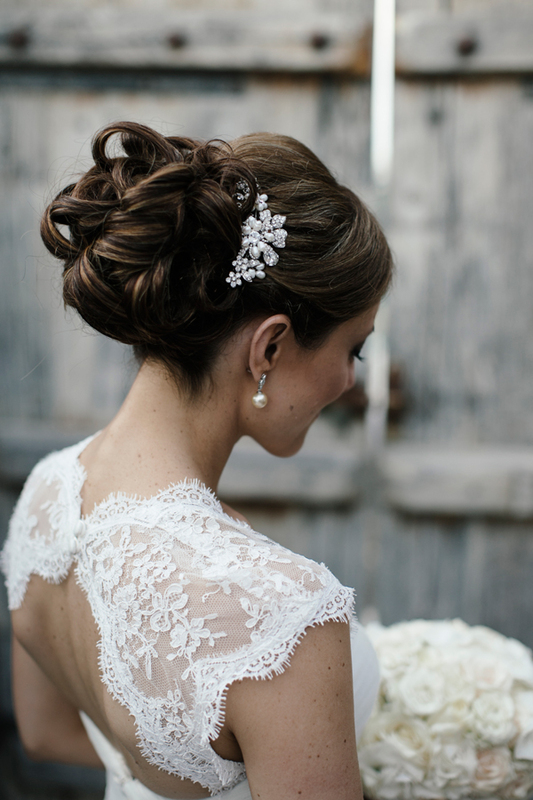 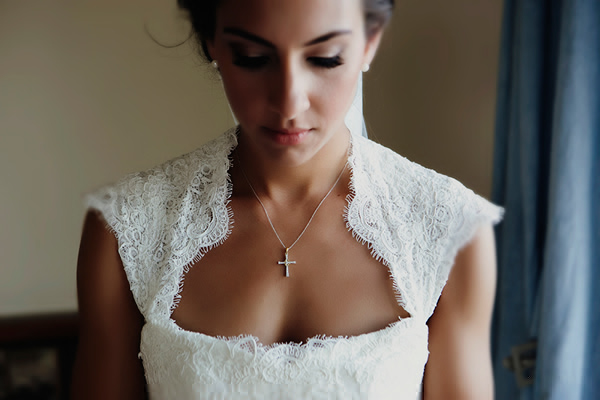 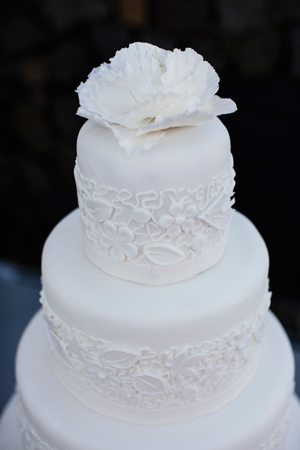 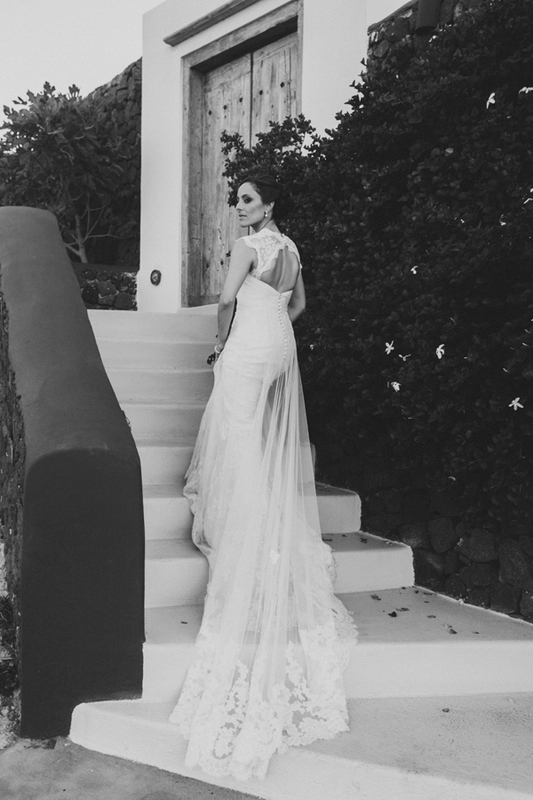 “My wedding dress was the Denia design by La Sposa. 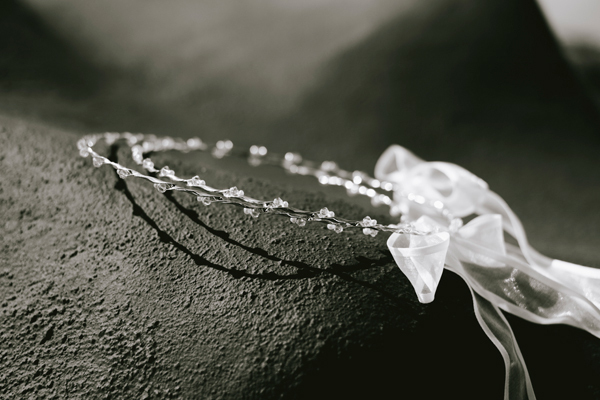 I bought it from Bridal Rogue Gallery in Marleybone, London. 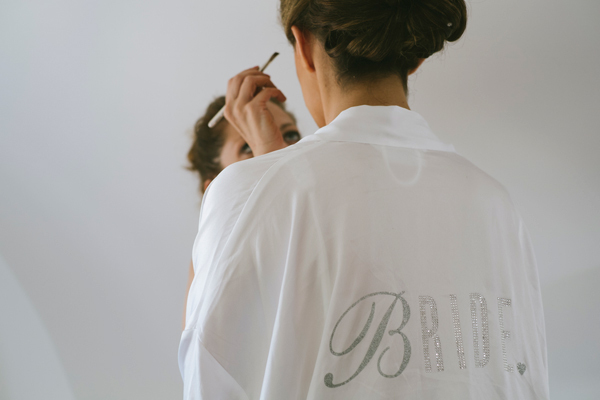 They added cap sleeves and a key hole back as this was what I had always wanted”, Anne-Marie shared with us. 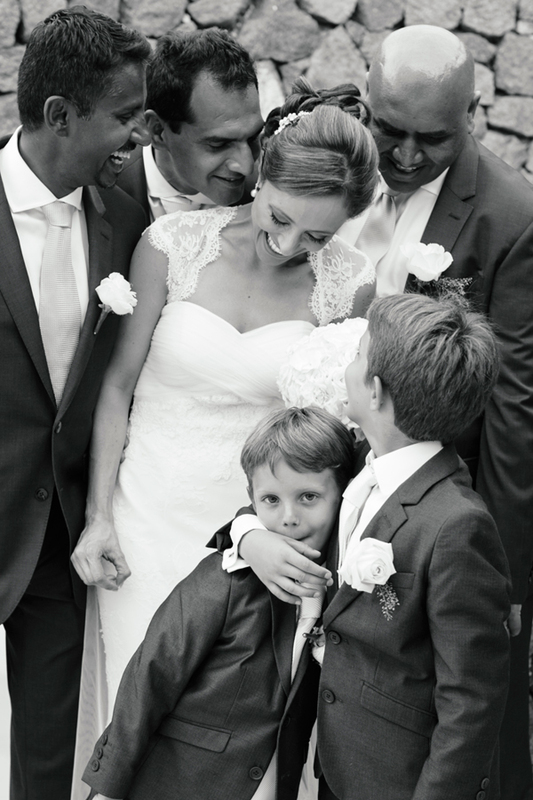 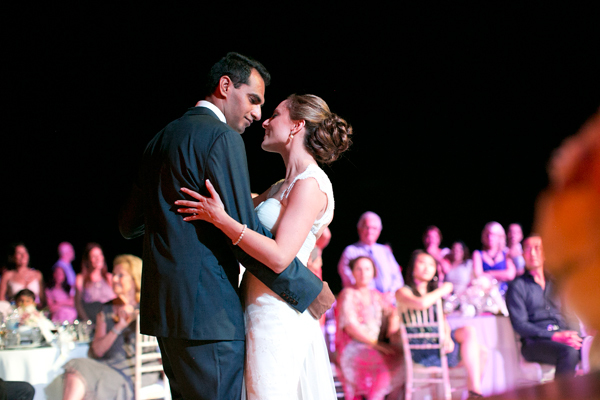 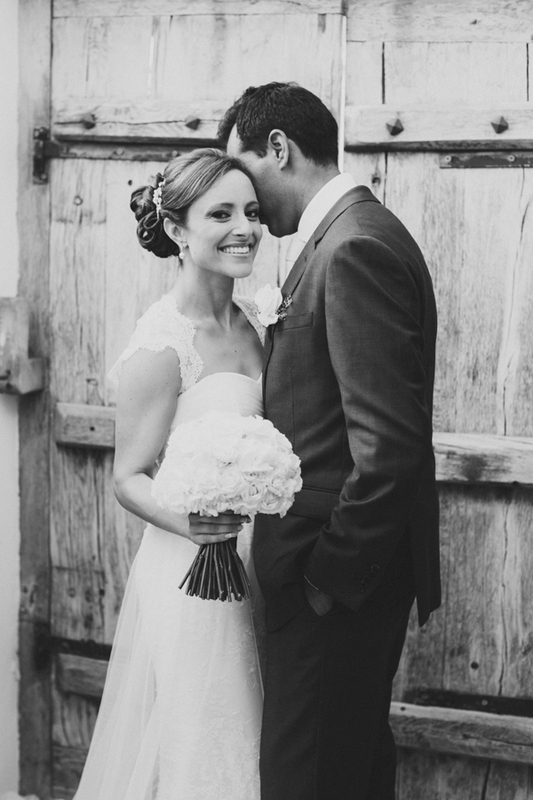 The beautiful bride describes how she met the love of her life: “We met through a friend. 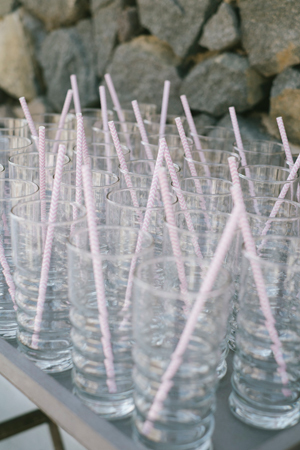 A group of us went out for drinks. 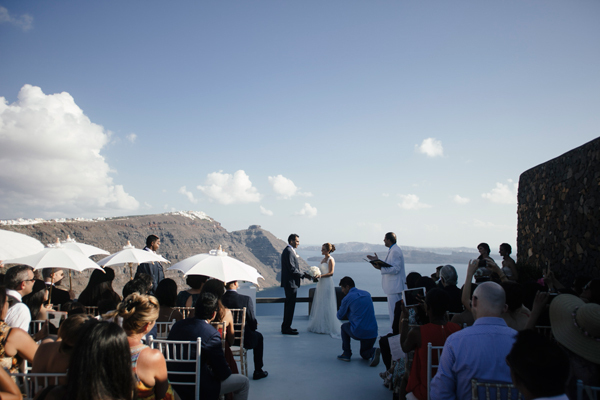 We saw each other at a party three months later and he walked me home and then asked me on a date a week later… Shahid proposed to me during a trip to Positano (Amalfi Coast). 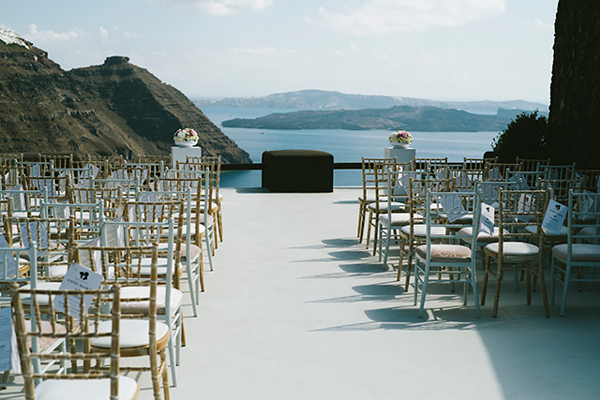 It was my dream to go there as one of my favorite films ‘Only You’ was filmed there. 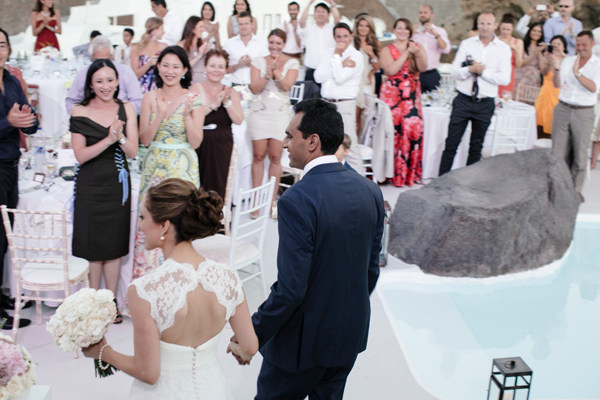 He proposed after we had dinner at a beautiful restaurant called La Sponda overlooking beautiful Positano”. 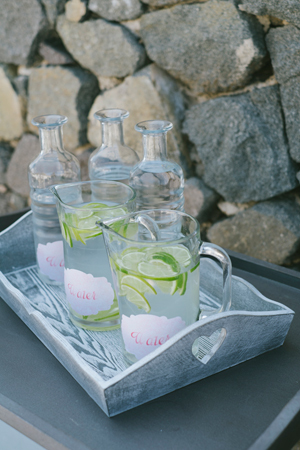 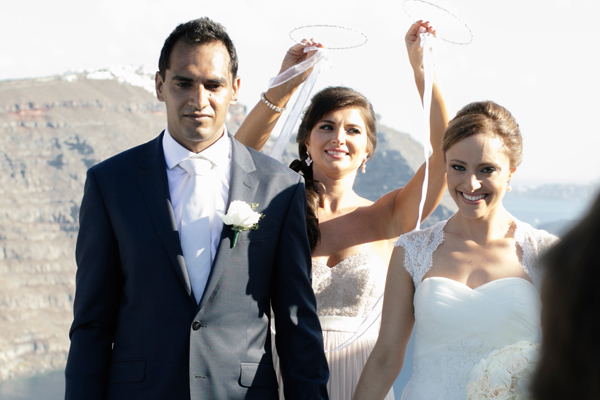 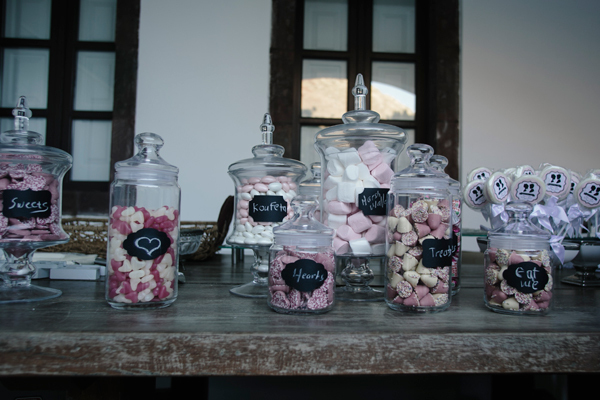 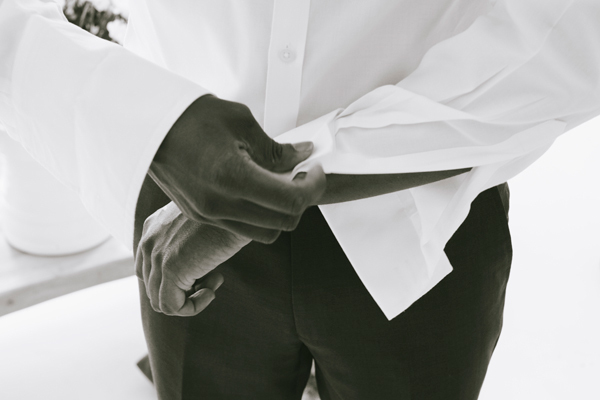 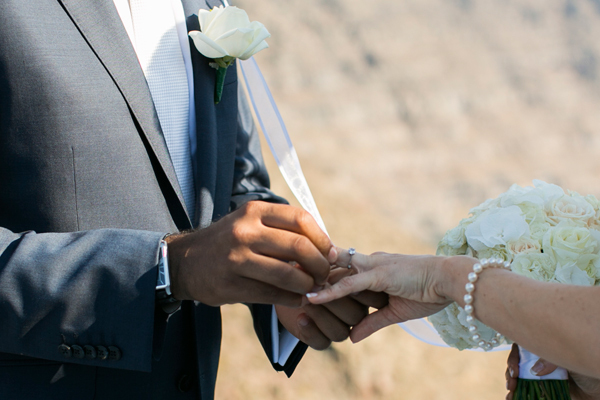 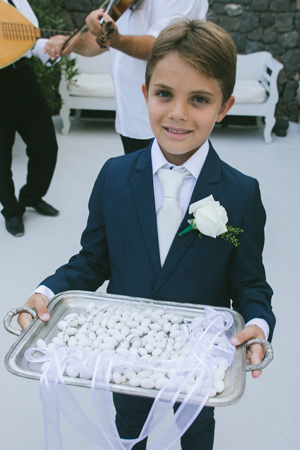 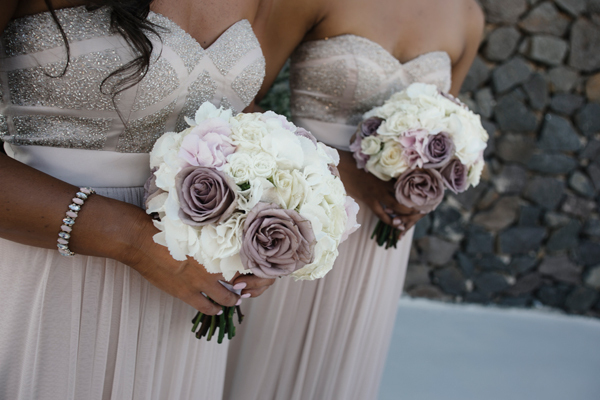 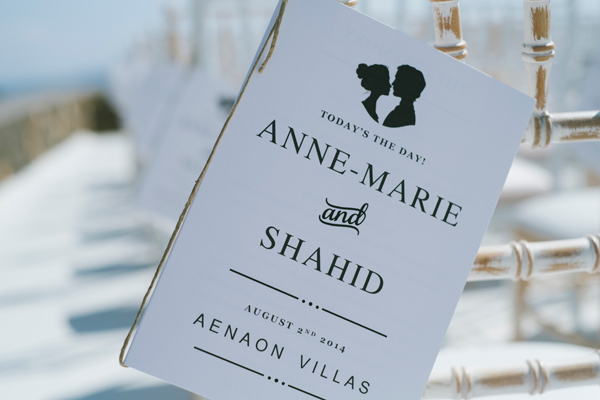 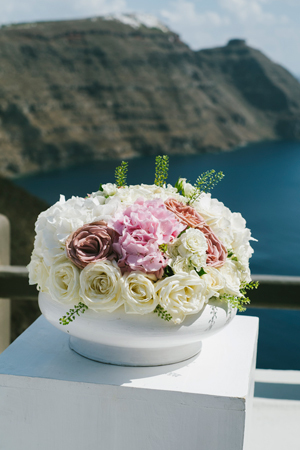 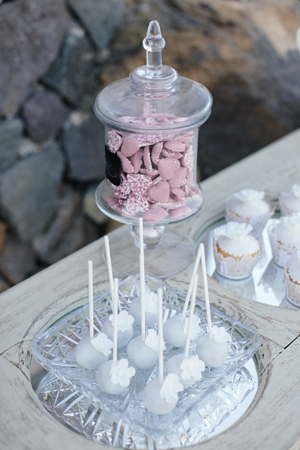 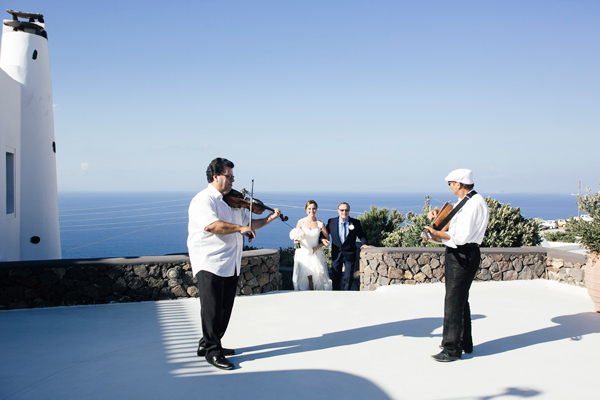 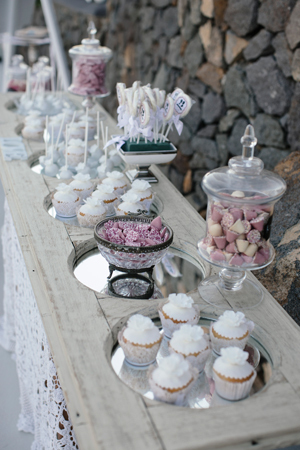 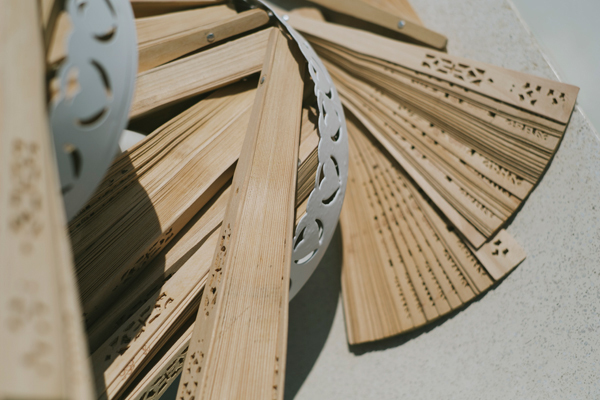 The white and blush wedding in Santorini had beyond gorgeous details. 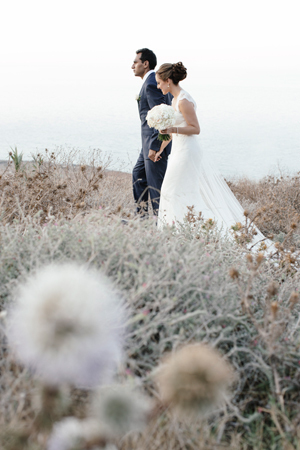 As Anne- Marie told us: “I wanted something that was romantic. 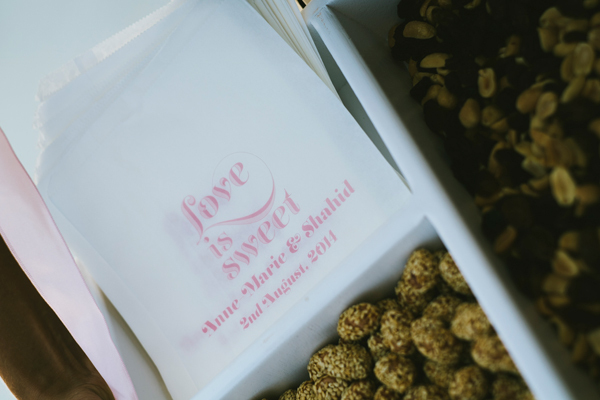 I chose a blush wedding theme and incorporated this in my bridesmaids dresses, flowers, candy bar and elements of mint/blush in my invitations and table names. 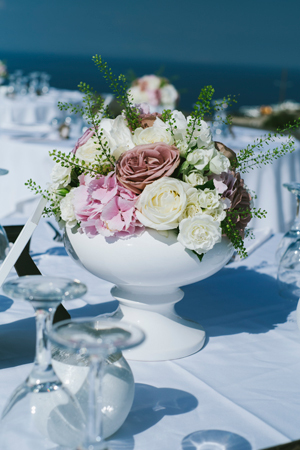 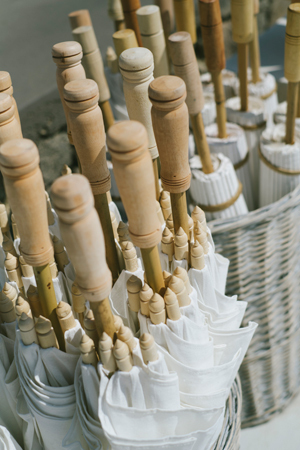 We had fans for our guests, umbrellas, soft pink, antique pink and white flowers. 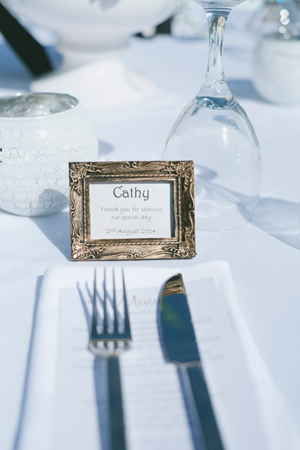 Travel was also an important element of our wedding as our invitations had a vintage stamp silhouette theme which was also incorporated in our table names and order of service. 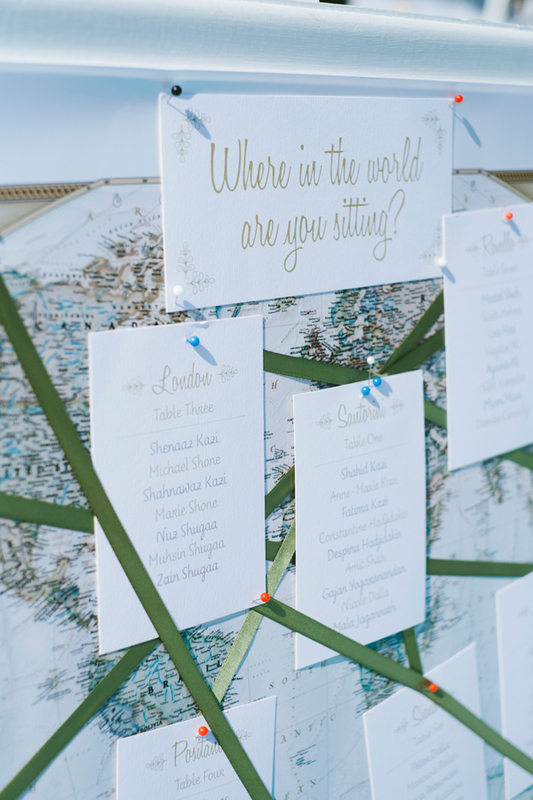 Our seating chart also had a map of the world with all the places we had travelled to listed as our table names.Overall, the theme was timeless romance and elegance”. 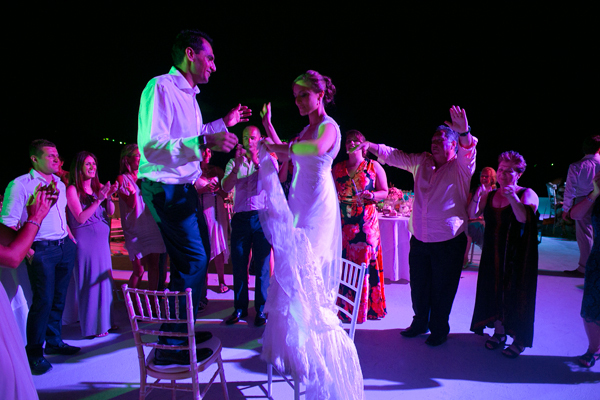 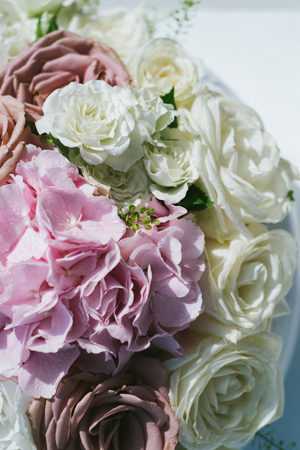 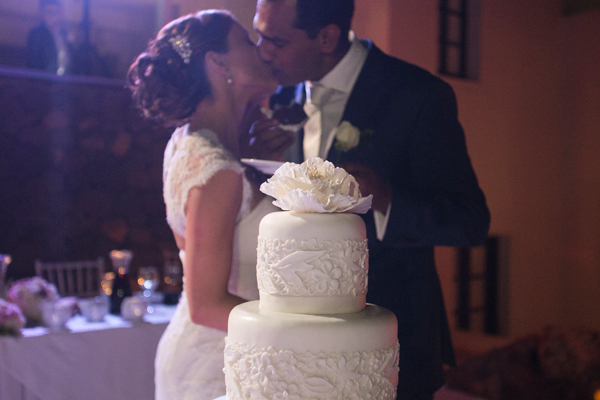 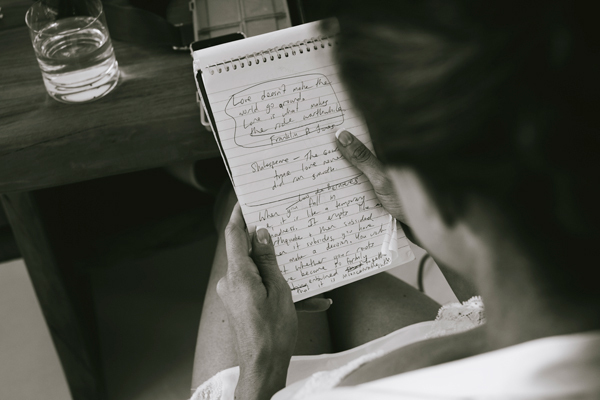 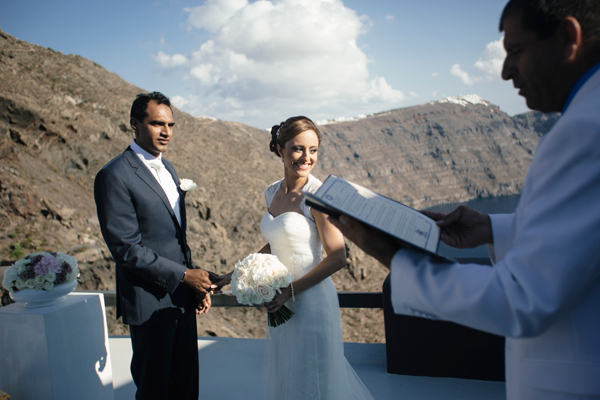 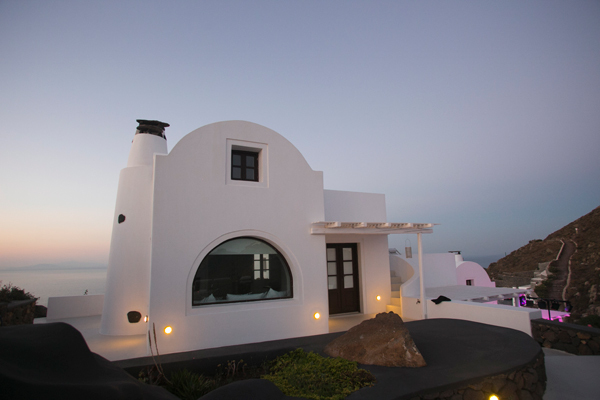 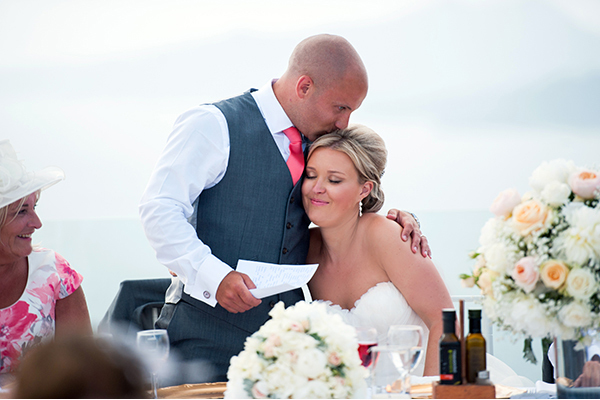 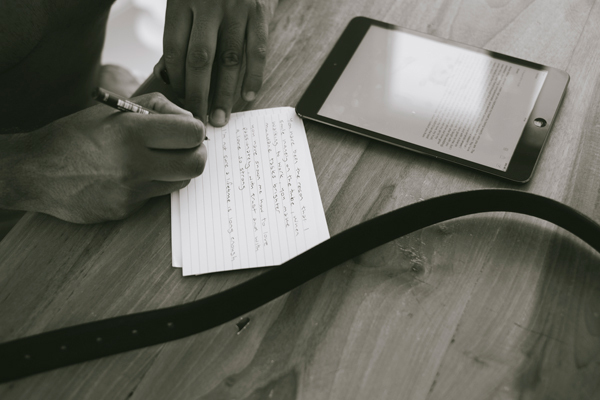 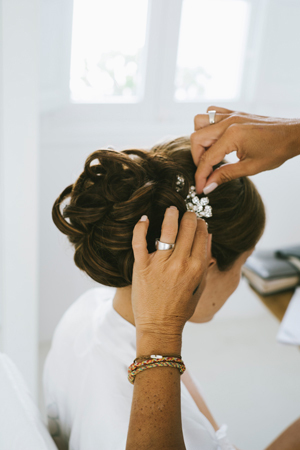 “The best decision we made was the choice of venue – Aenaon Villas was superb! 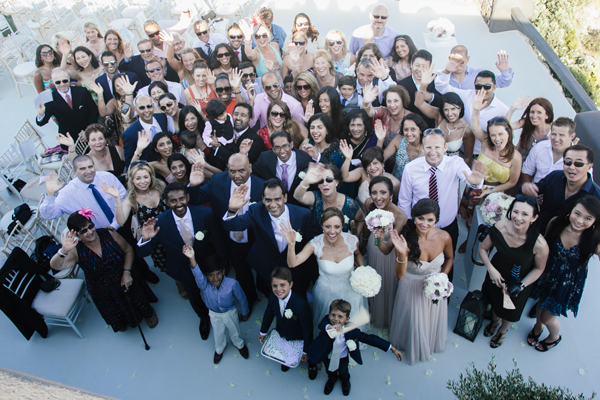 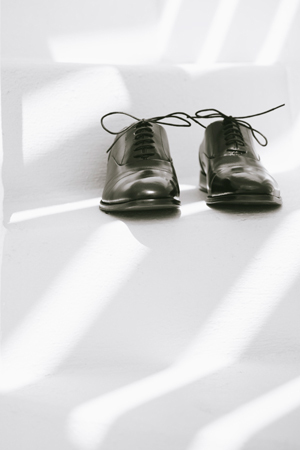 My only bad decision was that I wish my pre-wedding party (a cruise the day before) finished earlier as I struggled to get to bed the night before the wedding as I was so excited to see all my guests all together on the cruise”. 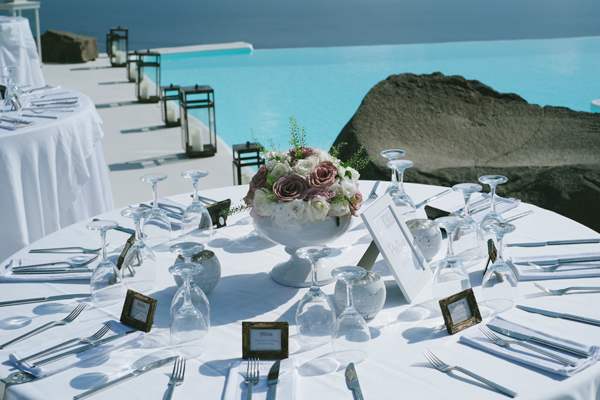 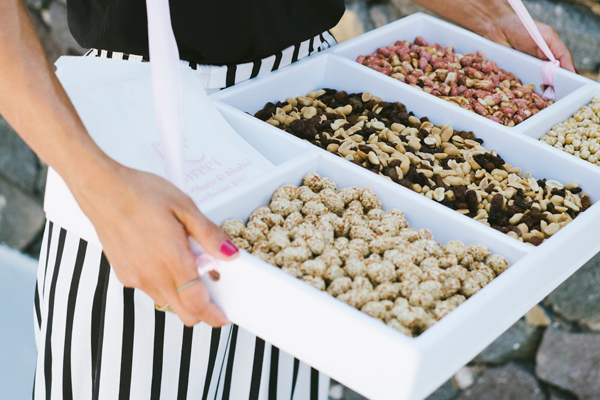 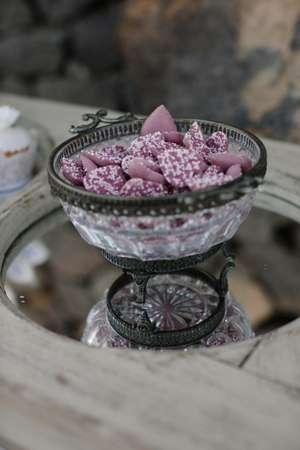 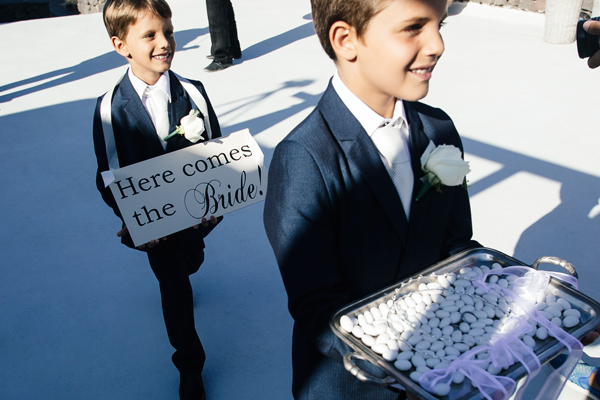 Fabio Zardi Destination Weddings, Spicy Bites Catering are on Chic & Stylish Selected Vendors.